Hoffenheim may now be Bundesliga old hands, but having played in Europe for the first time this season, they found themselves in a similar situation to a club mastering their second year after promotion: entering new terrain, with new expectations. The second-season syndrome – or sophomore slump – is a term used generally to describe the toils and troubles a club endures in their second year following promotion, when they have been sussed out by their rivals and, generally speaking, tend to struggle. In a similar predicament, juggling the Europa League with their Bundesliga commitments - and being a club now expected to challenge for the leading positions - hampered Hoffenheim significantly. They won just one league fixture on the weekend following a Thursday night continental clash – beating Cologne 3-0 back in November – and were beaten on three occasions, drawing the other two. To put that into perspective, in the entire 2016/17 campaign, on their way to finishing fourth and qualifying for Europe, Hoffenheim lost just four games. It took Julian Nagelsmann's men quite a while to recover from their European exertions too, losing a further two of their opening three games of 2018. Since then, however, they have rediscovered the kind of form which led them into Europe last season – at just the right time. Hoffenheim have lost just once since late January, going down 2-1 at Schalke, and their recent eight-game unbeaten streak has put them into a position where not just Europa League qualification but even Champions League football next season is on the table. Over that period, only Bayern Munich and Schalke have picked up more points than a resurgent Hoffenheim. Last weekend Hoffenheim travelled to Leipzig for what was a crunch match in the European race, and far from simpe, despite their 4-0 win over Ralph Hassenhüttl's side earlier this season. What followed was remarkable. A 3-0 half-time lead stunned the Red Bull Arena, and the 5-2 final score stunned the entire Bundesliga. Watch: Hoffenheim's incredible 5-2 drubbing of RB Leipzig last weekend! "We were too passive in the opening minutes and had trouble down the flanks," said the perfectionist Nagelsmann. "In the second half we adapted which resulted in better attacks down the wings." One of the main keys to this recent revival is the return of Serge Gnabry. The on-loan Bayern forward missed much of the first half of the season through injury, but he has missed just one game since the end of January – and you guessed it, it was the Schalke defeat. 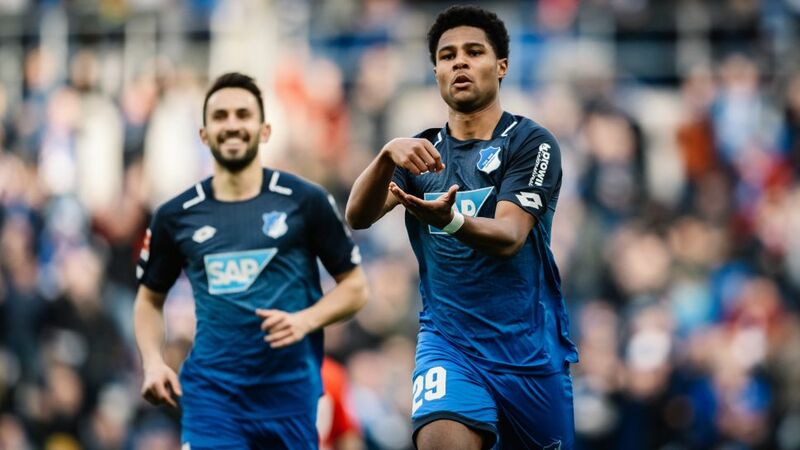 Seven goals in his last seven games, with two assists for good measure, have helped lift Hoffenheim back into contention for another top-four finish, and he hit the net for the four game in a rown in the win over Leipzig last weekend. That form has revived talk of him punching a late ticket for the World Cup this summer, with Nagelsmann wrapping his prize asset in cotton wool for the Matchday 30 win over Hamburg. "Serge had a twinge in his thigh in shooting practice so once he'd done his service to the team, we took him off as a precaution to ensure nothing happened," said Nagelsmann of the 22-year-old's reduced, hour-long shift. With Gnabry's goals, belief is back at the Rhein-Neckar Arena. "We want to get into Europe – we want it again," said Kevin Vogt last weekend. "We've got to keep things going, then we're going to be hard to beat. We'll do all we can to ensure we finish above seventh." Fifth place, as things currently stand, would mean entry into the Europa League, but Hoffenheim can aim higher than that. After the drubbing of Leipzig - which left their aggregate score over the second at 9-2 in Hoffenheim's favour - they host Hannover and travel to Stuttgart before ending the season with the arrival of Borussia Dortmund at the Rhein-Neckar Arena. Have Hoffenheim hit top gear just in time to complete an overtake manoeuvre on the Westphalians in the final 90 minutes of the season? Click here for more Hoffenheim news and features!